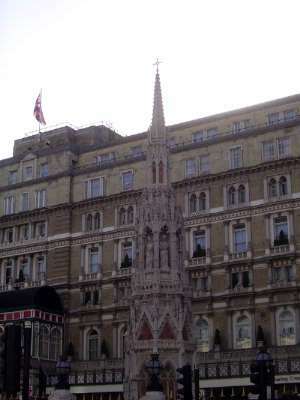 We begin at the Eleanor Cross, the successor to the long vanished Charing Cross. Charing Cross is the zero point for measuring distances from London--including the six-mile radius for the area that cab drivers must know. The cross was designed by E.M. Barry in 1865. He was also the architect of the Charing Cross hotel in the background. Yes, the two top stories are a sorry addition from the 1950s. Great decade in some ways but crummy in others.